You might think that typical German food only includes hamburgers, sausages, schnitzels, bretzels and apple strudel, washed down with beer. Well, I’m afraid that’s not too far from the truth. The chief also had that idea. So whenever someone came up with the idea to go for such a meal, she stepped down right away. It was always like that until we came across the potato and pumpkin strudel with lentils, the cheese noodles with red onions, the sweet potatoes fries or even the veggie burger. That was quite a revealing experience. And an eye-opening one for both of us. 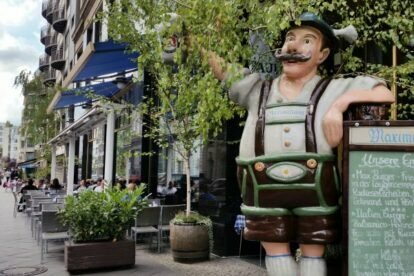 So, my recommendation is to go for the potato and pumpkin strudel with lentils with a Hefe Weizen dunkel beer or the unfiltered pilsener. Even if it is not Oktoberfest season they are still Bavarian, so the beer glasses are intimidating. The good part is that somehow these beers either don’t get warm or you could still enjoy them at room temperature.